^ CLEOPATRA (PG). British Board of Film Classification （英语）. 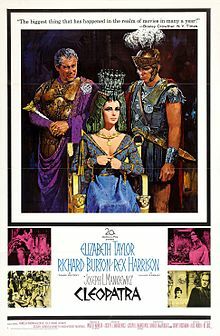 ^ 2.0 2.1 Cleopatra (1963). Box Office Mojo. [March 27, 2013]. ^ John Patterson. Cleopatra, the film that killed off big-budget epics. The Guardian. 2013-07-15 （英语）. ^ 5.0 5.1 Gachman, Dina. Cleopatra. (编) Block, Alex Ben; Wilson, Lucy Autrey. George Lucas's Blockbusting: A Decade-by-Decade Survey of Timeless Movies Including Untold Secrets of Their Financial and Cultural Success. HarperCollins. 2010: 460–461. ISBN 9780061778896. ^ Cleopatra (1963) from Johnny Web （英语）. ^ Cleopatra - Rotten Tomatoes. Rotten Tomatoes. [2017-02-27]. ^ The 36th Academy Awards (1964) Nominees and Winners. oscars.org. [2011-08-23]. 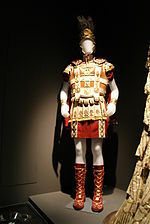 ^ NY Times: Cleopatra. NY Times. [2008-12-25].